A kati roll or kathi roll is a street food which is originated from Kolkata, India. In original form, this roll is a skewer-roasted kebab wrapped in a paratha, it can be a bamboo or iron skewer. 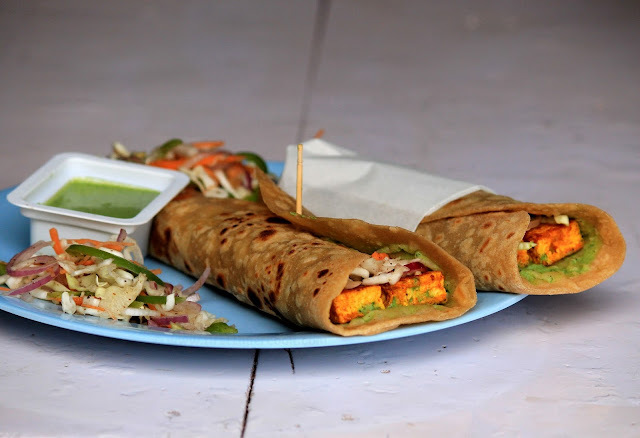 Now-a-days any wrap containing a filling (even when neither kathi nor kebab was involved) enfolded in a paratha or roti is called a kathi roll. The bengali word 'Kati' or 'kathi' means stick. Traditionally these rolls are prepared with a paratha made up of all purpose flour (maida), one side of the paratha is coated with egg and then wrapped into a roll with a filling (mainly chicken or mutton kebab). 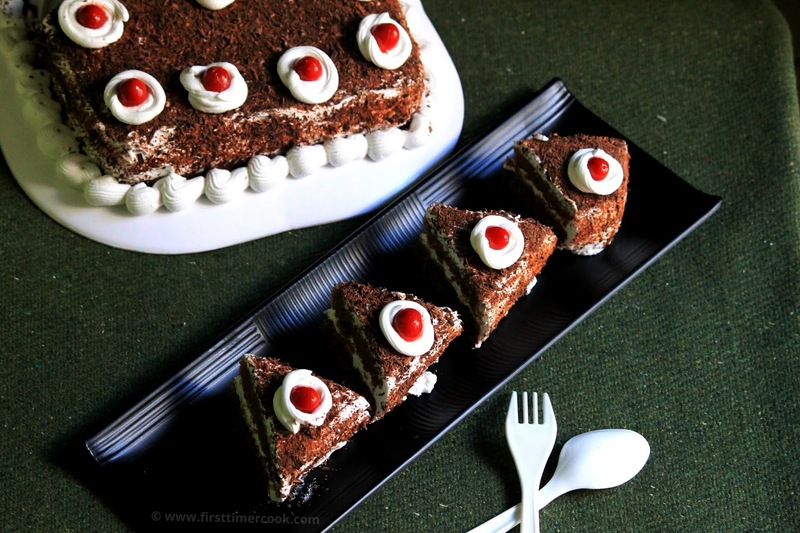 In this recipe, I have come up with a vegetarian healthy version which is equally yummy too. Instead of maida, I have made the wrap dough with wheat flour and then filled with paneer tikka. 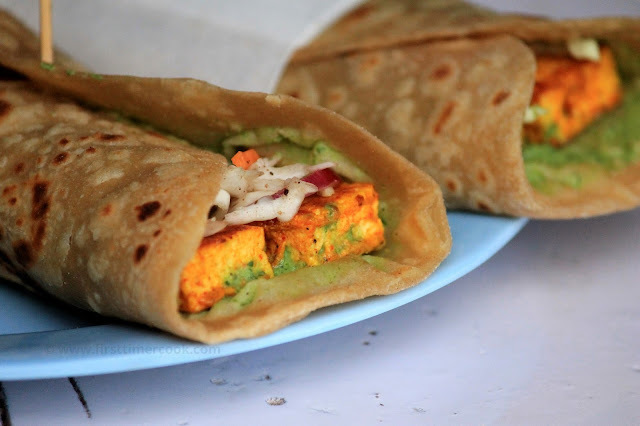 This paneer tikka kathi roll is absolutely delicious as well as a nutritious dish. These can be served as an snack or appetizer in parties. 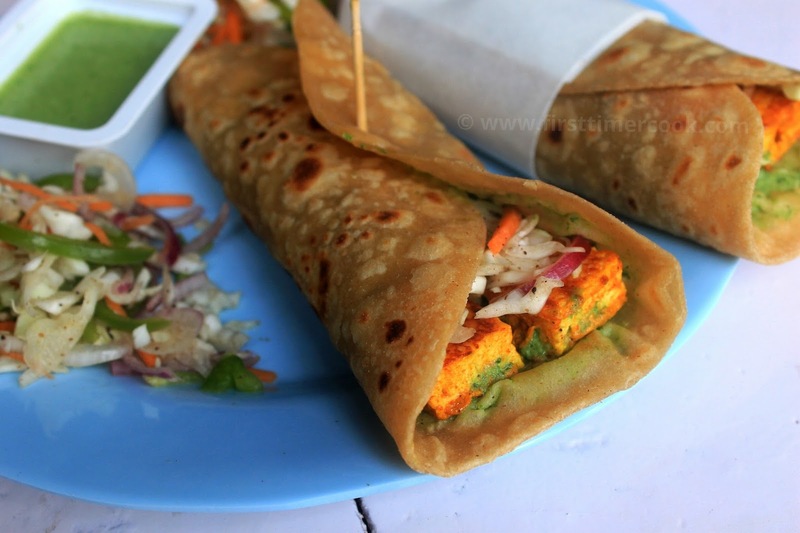 Below is the step by step guide for how to make the paneer tikka kathi roll. First cut paneer into cubes of 1 inch size. In a mixing bowl, take all the ingredients mentioned under marination, except paneer and oil. Mix very well. Then add paneer cubes and gently mix so that the paneer cubes are evenly coated with the marination. Cover and keep aside for at least 30-45 minutes. Now in another mixing bowl, add wheat flour and salt. Add a little water at a time and make a smooth soft dough. Then add 1 tsp oil over the dough and knead for a couple of minutes again. Cover and keep aside. Mean while, in a bowl take shredded cabbage, sliced capsicum and onion, grated carrot, lemon juice and chat masala. Mix everything and keep aside. Heat a non-stick pan, grease it with oil. Put the marinated paneer and cook on low-medium flame turning at intervals. Once the paneer cooked completely, switch off the flame. Take a ball and roll into thin roti. Heat a tawa, place the roti on hot tawa and cook it on both sides by smearing oil over it until the roti becomes brown in color and slightly crisp. Similarly do for rest dough balls and make rotis. Now it's the time to assemble the roll. First place a roti or chapati on a plate, then spread the green chutney over the roti evenly. Next place the paneer tikka cubes in center and topped with the vegetable mixture. Sprinkle some salt and finally roll both side tightly. 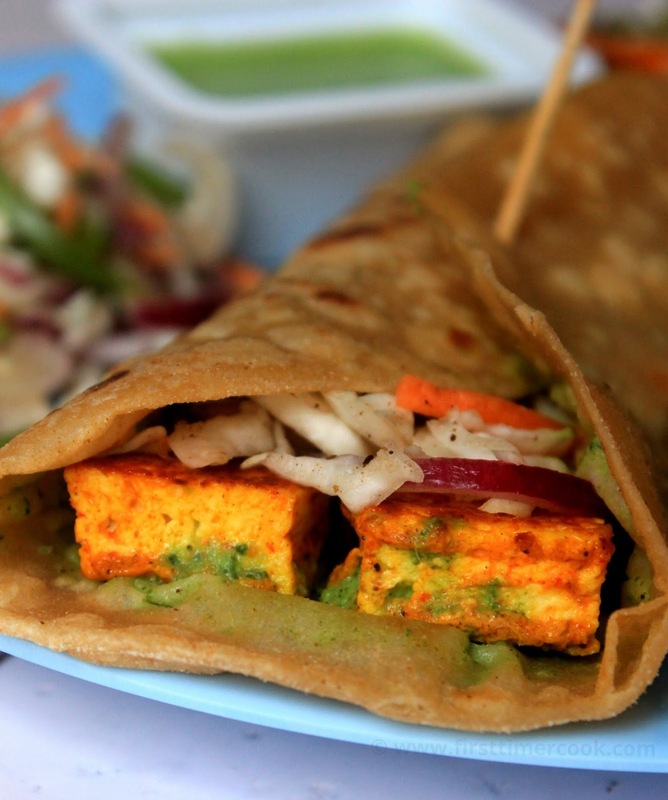 Secure the edges with a toothpick or wrap the roll in wax paper and serve scrumptious and yummy paneer tikka kathi roll ! Instead of greek yogurt, hung curd can be used. The addition of oil helps in creating a crisp texture to the rolls. Eat these rolls right away after assembling, otherwise they may get soggy and loose their taste. Thank you so much, just visited urs one.